It was raining just before lunch today so, rather than go for my walk (and get wet feet in the process), I decided to run to Wal-mart and do some last-second birthday shopping for my wife. As I was standing in the checkout line, I happened to see bags of Cookie Pop Popcorn. I was intrigued and, since the bags were just $1, picked up a bag of the chocolate chip variety. I finally had an opportunity to try it this afternoon and, overall, I think my experience with it was a positive one. To tell you the truth, this product was actually better than I was expecting it to be. When I first saw it, I was concerned it would be too sweet. But, the cookie flavoring wasn't anywhere near as overpowering as I was expecting it to be. 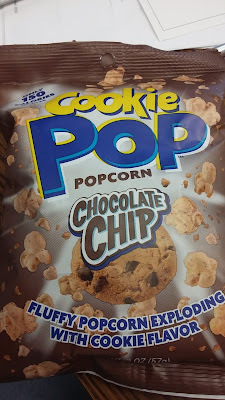 And, unlike many other products I've tried, I did think the popcorn tasted quite a bit like chocolate chip cookies. Another concern of mine was how fresh the popcorn would be. I lost count of the number of times I have purchased a product like this only to discover the popcorn was stale (even if it hadn't reached its expiration date yet). This popcorn, in comparison, was relatively fresh. Granted, it wasn't as fresh as newly-popped popcorn. But, it was fresh to the point I didn't feel as though I wasted my money on it. Is it a product I would buy on a regular basis? Probably not. But, that's mostly because I really don't buy snack items of this nature very often. However, if I were in the mood for a light snack and this was one of my options, I would definitely consider buying it again and do recommend giving it a try.